While much is written about real estate market values in Phuket, undoubtedly the sleeping giant of the resort grade property is foreign currency fluctuations. Why you might ask? Well the majority of transaction activity in this segment are transactions by foreigners unlike other markets in Thailand. 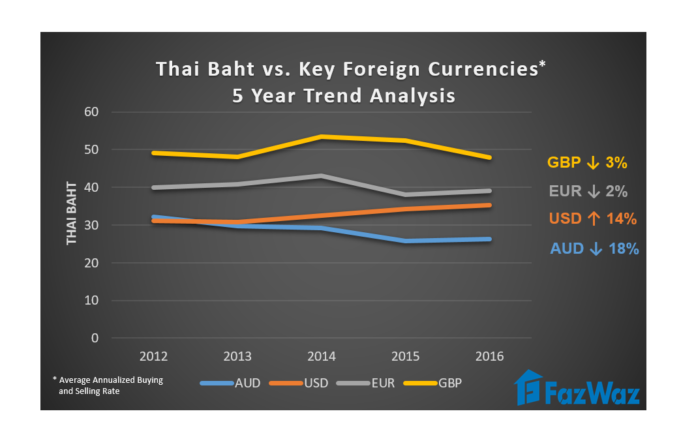 According to data on FazWaz.com the relationship between the Thai baht and popular perceptions might surprise many readers. Looking back at the top of the post-Millennium property cycle in the mid-2000’s arguable the most significant impact to the island’s booming property trade was the sharp decline of the British pound to the Thai Baht. This was a prelude to the global financial crisis at the time the buying profile of upscale Phuket property was highly slants towards UK buyers. Of course these individuals were not all based the long–haul market but the pound was the home currency of many expatriates living in Hong Kong and Singapore as well as those living here already. We all know what came next with the Global Financial Crisis, but the true liquidity issue that slowed the market to a crawl was first triggered by exchange rates. Moving into the post GFC new world order, and taking a glance back at the past five years (2012-2016) the net movement of the Pound and Euro against the Thai Baht showed collective declines of only 3 and two per cent respectively. Looking down under though the Australian dollar over the same period plunged by 14%, while the US dollar went upward by 14%. So what does this mean to market trends? In reality there are two very diverse transaction markets. The first are new and off- plan sales, with the second being resales. In the case of the latter, pricing remains somewhat sporadic given many owners might enter with high hopes and later are willing to offer wholesale discounts. With other existing foreign owners, often time ad hoc situations come into play with pricing dropped for a fast sale in the case of an illness, business downturn or simply investment fatigue. When we look at these discounted trades, oftentimes the holding period has been long and at the end of the day the seller is looking not at the baht price but what will the yield be in their home currency. More losses and gains are often made on currency versus market values in Phuket real estate. For new buyers, their main concern when buying off plan is ensuring their progress payments are locked in, and in a number of cases we see contracts reflecting this given over the development period falling foreign currency could make properties more expensive than anticipated. Sitting here in 2017, we now see a rising number of Asian buyers from Greater China, Singapore and other short haul markets who are willing to accept lower expected yields on properties given narrow interest rates in their countries and slumping property markets. The investor of the present is not the same as those in 2005. Expectations are lower, as are sizing and pricing points and horizons longer.